Three years ago, Laos was just a thought. Back then, Indochina sounded like a peculiar place to be, but my guts weren't enough to bring me to the crazy streets of South East Asia, albeit I am Southeast Asian myself. I have been waiting for the perfect time to check Laos. Before the chance came, I was very reliant about photos and stories online, most of which were vague and didn’t had a clear image of what I could expect. Because we were planning for an Indochina trip, it was necessary that Laos became part of the itinerary. This was my chance. Landing at Vientiane Airport, I knew this was a whole new world. The terminal was nothing fancy, the immigration officers, although appear authoritative, were dressed strangely. It was South East Asia, but the looks of the people around me are not something familiar, like how it is elsewhere. Right before entering the arrivals, you could feel how laid back it is and how eerie the silence was around although two other planes were waiting to take off. Its architecture, while resembling cultural taste wasn’t too grandeur to be overwhelmed with. Don't get me wrong, there is absolutely nothing bad about that but since I flew from the busy Kuala Lumpur before landing here, the sudden mood change was something very strange to me. People were living in a slow pace, entirely different from the chaotic Manila scene. Skyscrapers were nowhere to be found considering I was already at the capital. It was convenient that US Dollars are widely accepted in Laos. We headed to a taxi counter and got ourselves to the city centre, stepping out the airport, the weird calmness and silence still sorrounded me. While on the road, I couldn't help but notice how Laos has become a backpackers’ nook especially to Europeans. I met a number of newfound friends from all over the world, all of them giving me that backpacker vibe. We didn’t had much time in Vientiane as we were leaving for Luang Prabang after 8 hours but it sufficed to see much of the city. As on my bucket list, it was impeccable not to hop on the bike as a very popular means to roam around the city. The sun was high and wind wasn’t too generous, I felt the sun burning my skin but the sensation of biking around this laid back town was stronger than the painful heat. We found a bike shop that offers really cheap bike rents for the entire day at 10,000 Kip or a little more than 1 US Dollar. Through a pair of wheels I got to wander the streets of this capital city and see Patuxai, the very icon of Vientiane and The Golden Temple or known as That Louang. Over the top of Patuxai you get a good view of the city and a lot of souvenir stalls. From the view above, you get to have a glimpse of how ironically urban and rural the town is. There's a dozen of temples to see but I was biking at my own pace and before I know it, it was time to head back. Restaurants, cafes and hostels were plenty in Vientiane so being famished wasn't much of a problem. Since I was on a quick layover at Vientiane, I got to park my things earlier that day at the DD Hotel where I booked my bus ticket onward to northern Laos. That was before I got my bike to spin around the city. Having been grilled under the sun for hours, I was already feeling filthy plus my skin got two shades darker as my bike ride was nothing I have prepared for. A few meters away from DD Hotel, a nearby hostel offered shower rooms at $5 so I took a few mins to clean up before my shuttle towards the bus terminal came. Surprisingly, there were a significant number of visitors around, you could tell by the way they dress that they were backpackers who were making Laos as part of an extensive itinerary, myself included. Vientiane is not for the traditional tourists, its definitely different from the common tourist-hyped cities, but it is for the breed of backpackers who wants to have intimate moments over a cup of coffee with a book, a book to write or to have good conversations with old or new friends. It's perfect for a pilgrimage type of wandering and that's something that I really love about this town. I soon became hungry but finding good food was easy and the variety was just spot on, and price is cherry on top. Starving is less known in Laos as food and everything else are affordable. 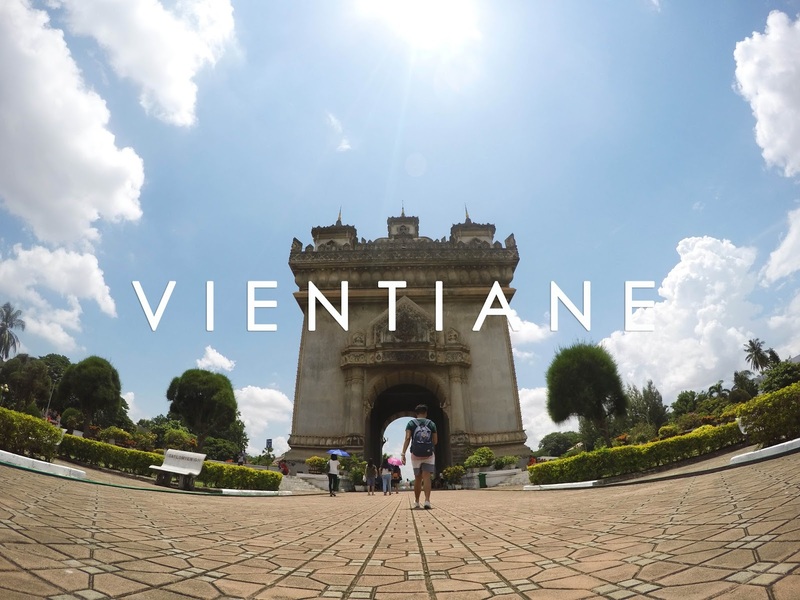 Vientiane as the gateway to Laos will give you a different feeling like nothing you might have been used to. Take advantage of how laid back the city is and feel the calmness of your surroundings, talk to other people and enjoy every moment. Before you know it, just by being there, you get to realize a thing or two - on what it is about is entirely up to you.